Dont't add metal-esque distortions to a Sufi song! The raging controversies amongst the adrenaline-pumping, hormone infatuated generation (otherwise known as 'youth') regarding Lalon's (the band) recent release has already sparked occasional fistfights during discussions. On one hand, people applaud the rejuvenation of classics and a musical genius that 'youth' wouldn't be naturally aware of; while the other remarks disdainfully on pushing experimentation to a level where it can no longer be related to the original composition. That's funny, considering Lalon is not the first band or artist who has done it. Bangla's second album, Prottutponnomotitto released in 2006 did something similar on the backdrop of a country going frenzy with religious extremism. The group voiced ten Fakir Lalon classics fashioned with a combination of instruments such as tabla, ektara, bangle dhol, guitars, percussions and even a choir. Lalon debuted in 2007 with Biprotip where they vocalized three Fakir Lalon numbers and caught up with a frantic crowd soaking in their music. Bappa Majumder brought Shah Abdul Karim numbers into the limelight and 'Gari Chole Na' is a favourite tune to hum along today. When it was okay and perhaps commendable back then, why are frowns and fingers being raised now? The problem lies in experimenting and commercialising. Bauls, being a community of their own, sing for the love of God. Whatever they write, it's to that audience, for that supreme entity. There have been various issues with people accusing Bauls of being intoxicated. But anyone who has experienced an actual Baul ashor can testify that the need for intoxicants is not necessary; the music and environment is quite enough. When asked about it, one Baul said he doesn't agree with the use of drugs and mentioned that the ecstasy and oneness that one feels with God/Universe cannot be compared. That is the ultimate goal of Bauls who follow Sufism, which suggests that the fate of everything is to be Fanaa, as in dissolve into the Nothingness that is Everything, i.e. God. As with the hippies of the west, the idea has been glossed over by focusing only on the negative sides. One of the things Bauls are very possessive about is their music. The traditional method of learning the art of musicianship is very medieval in a sense. There is a rigorous apprenticeship system, which involves both spiritual and musical teachings. That does not mean that innovation is frowned upon. Bauls and other various kothok-kobi (that's basically street poets) are famed for their witticisms. They are a dying breed one might liken to the rappers of today's world. Also, it stems from a sense of copyright and ownership. This is where things get a bit complicated. Bauls are quite lenient about copying tunes among themselves. One can find quite a few songs sung to the same tune, using different lyrics of course. 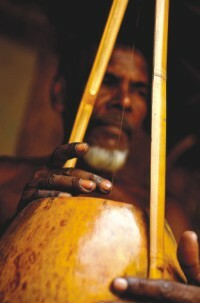 Within the Baul community, they know other Bauls understand the spirituality of it all. The lack of acknowledgement of that spirituality and of the personal prowess of the Baul involved is what's causing the discontent. The misinterpretation of spiritual ecstasy into earthly love for the materialistic society creates a tension that removes the original score far from its source. The picture, of course, has another dimension. Today's mass generation will perhaps be less inclined towards listening to a core Baul song amongst all the electric metropolis vibe. Adding in frills might as well make the composition more acceptable. The idea is to bring back a religious cultural concept amidst fast paced globalisation, and commercialism becomes inevitable. In the more apparent world, Sufism with a dose of pop has become increasingly popular. Courtesy of artists like Khailash Kher, Rabbi Shergill and Junoon, the young crowd has made peace with the idea of Sufi-pop. 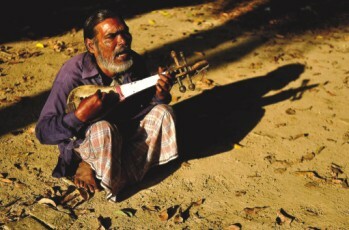 Shah Abdul Karim and Kangalini Sufia have made prodigious contributions and earned recognition in the promotion of Baul scores, both locally and internationally. The debate is endless, but in the end (because of column space), what is acknowledged is that experimentation has its limits. In all good intention, a perfectly well done remix can become a disrespectful indication towards a classic. What was generally felt is the extent one goes with 'reviving' and 'redoing', where the emotion of the original is best to be left unkempt. Baul or Sufi music comes from within and removing that aspect of devotion for any audience is uncalled for. On that note, the authors of this article pay tribute to the beauty and depth of Sufi music and to the innumerable Bauls out there whose belief in music enthrals us everyday.